I am not used to wear make-up, I know this might sound terrible, but I just never wear any face-powder, foundation cream, eye-leash or eye pencil. But I do wear lipstick, actually red lipsticks only, three or four evenings a week, when I have somewhere “special” to go. I was with my best friend on that Sunday, and Stefanie and I were texting and debating on whether to go with the ‘make up’ topic, and my friend had a good point: “Wow! I would die to open the beauty boxes of the women I know!" I somehow found this interesting and decided to pursue it: I though asked Stef if we could perhaps extend it to ‘beauty and hygiene’ products, or seriously my postcards would have been truly ridiculously empty. I only wear red lipsticks, as I said, but I do own very many of that: having to sit down to count and report them made me realize I am such an over buyer! And surveying my hygiene products only confirmed my finding. Over-buyer. But let’s focus on lipsticks, seriously, how could one have 16 red lipsticks that to a man’s eye would look exactly the same RGB value? I embarrassed my self with this question and I started to think how long some of those poor little things have been lying on my fridge (because yes I keep them in the fridge, I know Stefanie was pretty surprised about that!). So I figured my main data story should run around the 16 same-color lipsticks that travelled overseas and that I almost never wear. Since I wanted to give Stefanie the exact idea of how similar they are I used them as my marker: the red traces you see on the postcard are drawn with my lipsticks, they are ordered from left to right according to the moment in time I bought them (risk of data imprecision here: let’s say for what I remember!). I then connected them to the central part of the postcard: how often do I wear them? 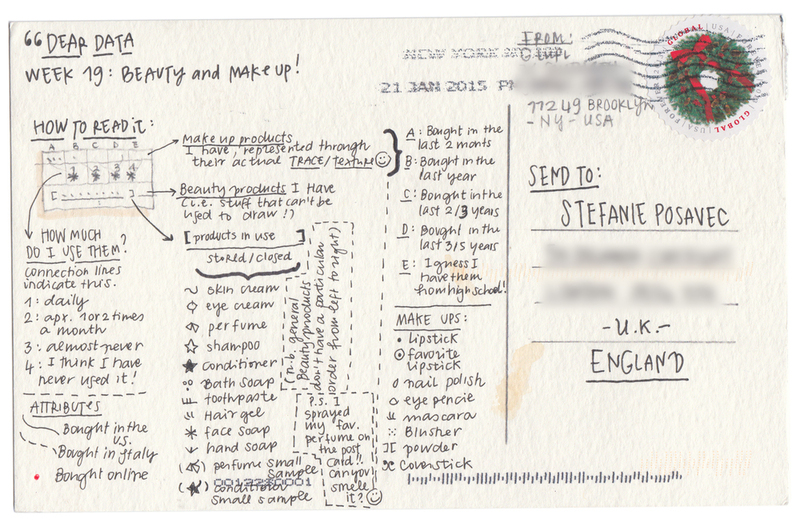 My (very few) other beauty products have been placed on the postcard following the same rules as well. p.s. 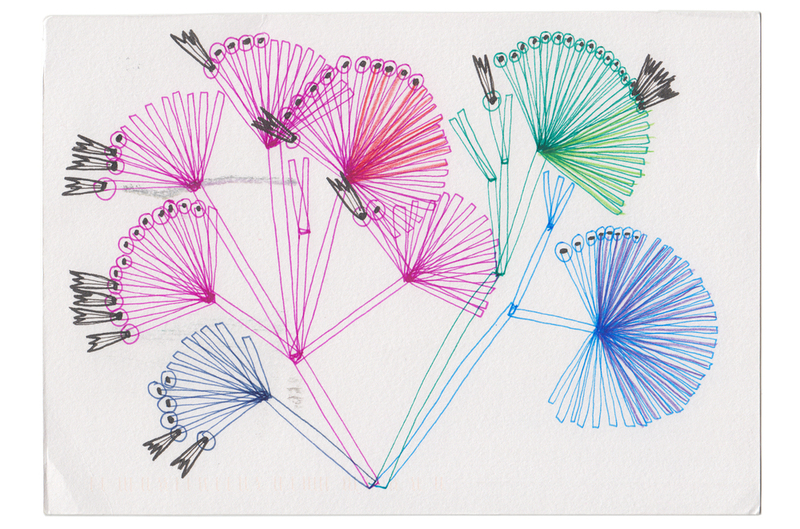 I sprayed my favorite perfume all around the postcard - Stefanie, could you smell it? p.s.2 and no, I didn’t throw any lipstick away after this survey. Stefanie, how many beauty products do you have!! I love that also Stefanie likes red lipsticks and that she also thought of categorizing her products according to how often she wears them, I guess this is the main ‘entry point’ for any women’s make-up survey! As after any week where we focus on a precise aspect of our life and personality, I started to think about my relationship with make-up and how it evolved through time. I’ve never really worn make-up. It just isn’t my thing. Throughout all this time, and still today I’ve had to tackle questions about why I don’t wear make-up. I know my friends wear make-up for many different reasons, and definitely not because they “need it” more than me to cover any kind of flaws. ...It’s not even that I don’t care how I look, I do care, I am just not sure I would look any better with the perfect cat eye…? And, I am almost never lazy in my life, but with this thing yes, I think I am probably also a little bit lazy. I am wondering what the products you wear can really tell you about who you are, if anything? I’ve been thinking hard this week, but I didn’t come up with any more insights!! p.s. I got into nail polish in several moments of my life (and this is one of those) but never really owned them because I would go to a manicure salon: it’s more like a “treat” to me than an actual beauty thing, and it’s so cheap! I don't like red lipsticks do I? As Giorgia and I both decided to create a comprehensive survey of our beauty products, this involved emptying all of my baskets and shelves of products onto the floor, then sitting in the middle of this mess and sorting my products into little piles by category. I’ve been honest in my data-gathering, as I’ve included some incredibly embarrassing beauty products in my survey. 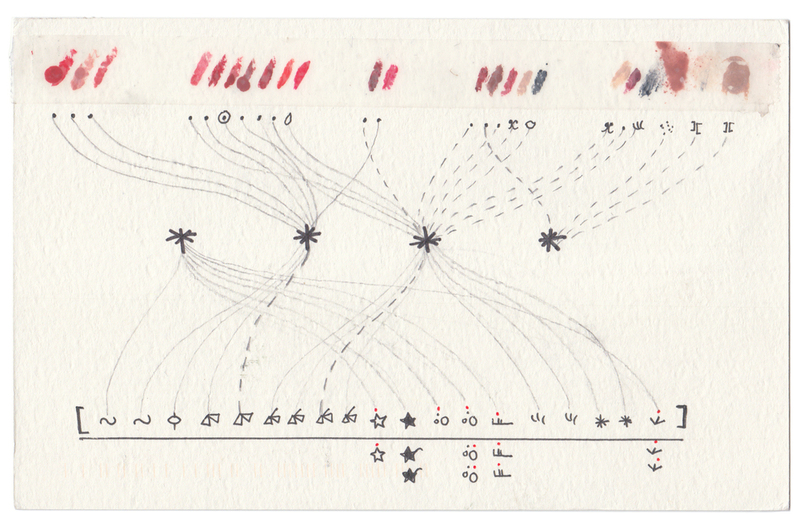 I’ll leave you to look at the card to determine what these are, and then let’s never bring up this dataset again. No shocking insights here, as it’s what I knew all along: my main makeup and beauty focus is on moisturiser and sunscreen for my face, as I have this small hope that through the repeated application of SPF50 on my face (and dodging the sun whenever it shines through a window) I will be able to preserve my face and look 30 when I am 80, but I think I may be deluding myself here. My other favourite purchase is red lipstick, mainly because wearing a nice red lipstick is a way of detracting attention from the fact that actually I’m really crap at applying eyeliner. This exercise also reminded me that I have a terrible habit of plundering hotel rooms for their fancy soaps and shampoos: every time I come back to a clean hotel room, the first thing I do is scoop up all of the little bottles and soaps and dump them into my suitcase without even using them, then await the next replenishment by hotel staff just to repeat the same pilfering procedure again. However, this scavenging instinct doesn’t mean I actually use these little products: instead, they just line up in neat little rows in my medicine cabinet, and whenever I open the cabinet door, I survey these stockpiles of hotel toiletries like a millionaire might gaze upon his riches. 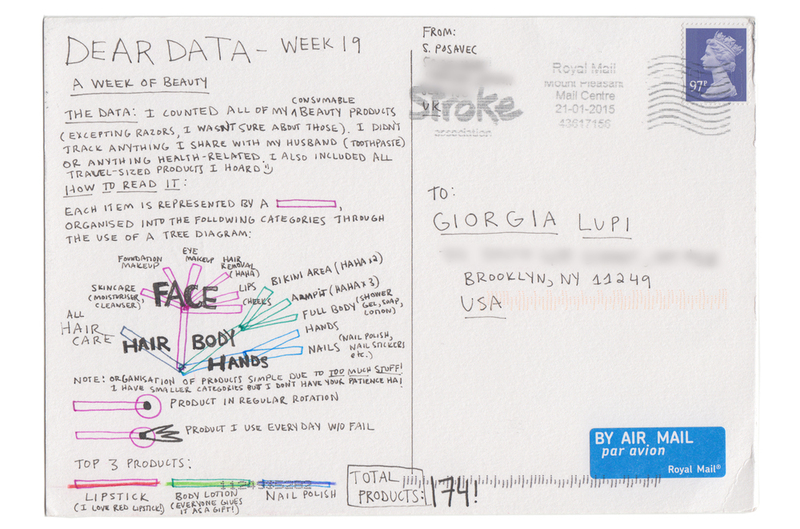 I thought this would be a good dataset to focus on the aesthetic of the drawing and the creation of a drawing system as opposed to neatly presenting any major data insight since there wasn’t really anything out of the ordinary to be found in my beauty product data. I tried to enjoy the act of drawing here, but instead, drawing this card frustrated me, as the final card never had the spontaneous feel and drawing style that my preliminary exploration drawings had. I enjoyed drawing the preliminary concepts more than the actual card in the end. While I find drawing data freeing because (like Giorgia mentioned earlier) quantitative drawing offers a way to draw without fear since some of the decisions are made by the data for you, I’ve found that I often get the best effects by applying my drawing rules in a more random, spontaneous way than when using actual data. Often I feel as though working from a dataset can end up stifling the drawing, which is an interesting turn of events for me creatively. I like that Giorgia actually applied her makeup to this card! By seeing her actual makeup colour palette, you definitely gain an understanding both of the makeup she wears now (red lipstick, hooray), and also the colour palette of makeup that she first started wearing in her past. I know that getting excited about something as mundane as makeup seems strange, but remember, we never see each other! Since these aspects of daily life are missed since we live on two different continents, so I quite like learning more about such a small, everyday part of Giorgia’s life. What’s interesting is that I don’t think I’ve ever really gone into such detail about makeup and beauty preferences with my friends I see regularly in London, to be honest. I liked these drawings, it was fun to make them. But how come I can't achieve the same effect with data? Goodbye, card. And good riddance!